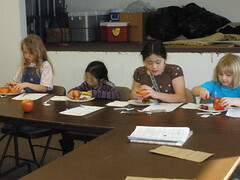 I’m teaching a four-session agricultural class to a group of homeschool children. This class is for 4 girls (Olivia and Sophia plus 2 other homeschooled girls). For this class, I’m teaching the children about seeds – in fruit, wildflowers, grasses, sprouts, and edible ones. They did a variety of hands-on activities including the one pictured to the right and below. Here, to the right, the girls are cutting their pieces of fruit and then counting the number of seeds in them. They then put the number of seeds on a chart and then compare their estimates to the actual count of seeds. After they were done, they enjoyed their fruit snacks.